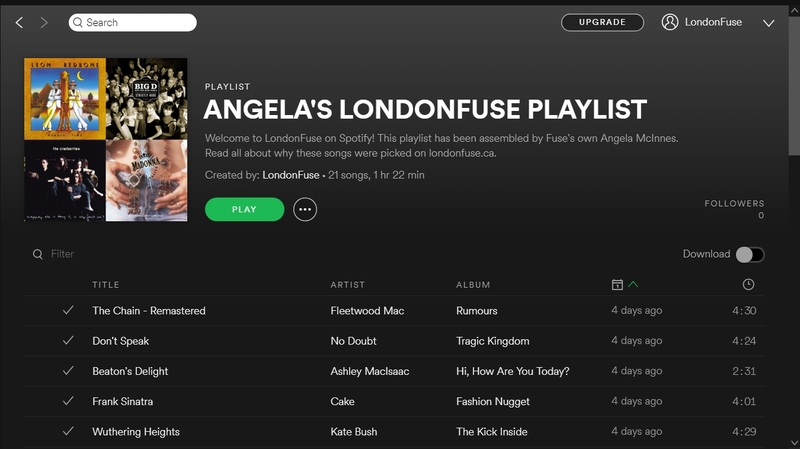 The LondonFuse Playlist series is all about getting to know our amazing group of volunteers. Each week, we'll offer you a Spotify playlist personally curated by one of our fellow Fusers. A dark breakup song with a great beat and melody that demonstrates how painful life experiences can be turned into great art. I stole Tragic Kingdom from my older brother when I was nine and never gave it back. Gwen was my hero. This song takes me back to a time when I had the whole world ahead of me; when I listen to it I remember that I still do. I played fiddle for a few years when I was younger and was kind of okay at it. Beaton’s Delight makes me want to play again. I had no idea what to do after graduating high school and ended up working both a night job and morning job. Between shifts, I’d watch The Sopranos and play guitar to keep awake. This song played at the end of a Soprano’s episode and I never forgot it. Like many English majors, Bronte’s Wuthering Heights was my gateway to the nineteenth century. Kate Bush has the voice of a can-opener, but this earworm made for a great accompaniment to the novel. My favourite Joy Division song. The last song ever played on CBC’s The Signal, and eerily the first song I ever heard on the show as well years back. This song explores how one becomes their own person while paying respect to their past. And it sounds cool. The perfect tempo for bad dancers like me. The singer begs us to let him put off facing harsh realities and enjoy childhood for just a little bit longer. Always a cathartic listening experience. I’m not going to lie. I love this song because of Donnie Darko. To Pimp a Butterfly expanded my musical horizons and my mind. Another film reference, this time to Danny Boyle’s Trainspotting. This was a repeat listen during a recent road trip to northern Ontario. It’s pretty embedded now. This song has an incredible message about valuing yourself first in a relationship, but I’ve applied the lessons of self-assertion to many other scenarios. Thanks Madge! When I was 16 I thought it’d be a good idea to hop on a Greyhound going to Alberta. It was my first major trip and I was too excited to sleep. I listened to The Cranberries on my Discman as we drove through the Saskatchewan prairies at night. I looked out the window and watched lightning bolts strike over the flat, empty land. I eventually learned that the trip was not such a good idea after all, but I’ll never forget that storm. My go-to good mood song. Because if there’s one thing the world needs more of, it’s Leon Redbone.